An isoseismal map shows the Modified Mercalli Intensities (MMI) reported from a particular earthquake. To use the metaphor of a lightbulb; an earthquake has a fixed magnitude (the Watt rating of the bulb), but the intensity varies with distance (the brightness of the light). By plotting intensities, we may learn more about the mechanisms for earthquakes in those areas. Isoseismal maps are derived from felt reports – accounts from people who felt the earthquake. We also ask people to fill in these reports when they are in the earthquake area and did not feel it, as this may reveal something about the local geology. 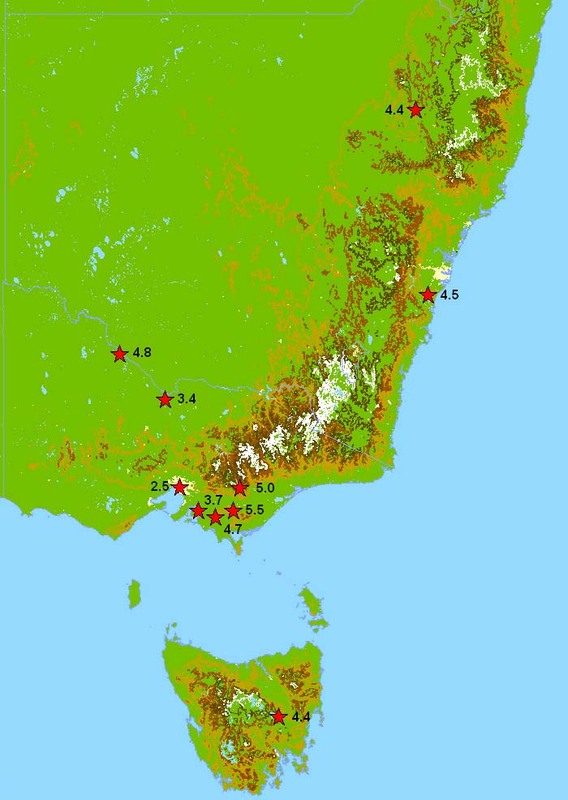 This map shows earthquakes that have occurred in southeastern Australia for which the SRC has generated isoseismal maps. Click on an event in the list below to download the PDF isoseismal map.